At its very core, Monika Petrillo's film Flyabout is aimed squarely at pilots. Come on, what aviator wouldn't want to ride along on a 30-day circumnavigation of Australia in a flight of GA planes, chasing dreams, making lifelong acquaintances, and possibly dodging a few wayward kangaroos? Monika Petrillo has never been a person to postpone her dreams. So at 24 she decided to get a pilot's license. A year later, her father surprised her by learning to fly as well. As the movie begins, they take off together to circumnavigate the continent of Australia. The only woman pilot in a group of eleven people, Monika experiences the true freedom of flight above one of the most untouched places on earth. As she becomes exposed to Australian culture, she learns about the Walkabout, a spiritual journey the Aborigines have valued for tens of thousands of years. That inspires her to use this trip to take stock of her own spiritual household. The first step toward that end is to relax. But that proves much more difficult than she thought: a tight schedule, careful and constant maintenance of the aircraft, pot-holed dirt runways, mechanical failures, sudden loss of visibility and unpredictable crosswinds keep her both too busy and too uptight. But what impacts her most is the conflict that arises between her father and herself. They had both underestimated the consequences of her father‘s limited experience as a pilot, and that quickly takes its toll—not only on the collaboration in the cockpit, but also on their relationship. Monika struggles with feelings of responsibility on the one hand versus doubts about contradicting her father, who has always been her role model, on the other. As their plane continues its path across the outback, the young woman slowly comes to realize that personal and spiritual growth can‘t be forced. Instead of searching so hard, she starts to look out the window. And that simple action is the first step towards learning the real lesson. 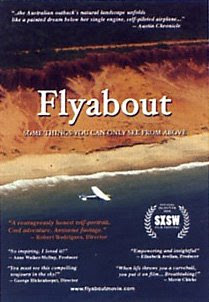 Flyabout is an intimate, personal story about a pilot‘s journey around Australia. It is the story of a young woman growing into an adult and coming to grips with how generational roles change over time. The last paragraph of the synopsis really is the takeaway here. This film is layered so deeply, it cannot even remotely be considered "just" a travel film. One minute, the screen comes alive with gorgeous footage of vast Aussie sunsets, and in the next scene, we are flying across endless vistas of the Outback. But just when you begin to settle into the joyride, Petrillo launches into a multi-faceted story designed to make us think about, life, family, relationships, destiny and our inner being. Of note are Petrillo's poignant thoughts about how we all need to learn the ways of the Aborigines once in a while and strip away life's stresses and cleanse our souls. She talks about the importance of getting out into nature alone, where you can focus on...you. I cannot agree more with that notion. My only struggle throughout the film was Petrillo's contentious relationship with her father. This trip was meant to be a once-in-a-lifetime thing, a memory you remember long after dads go west to fly with Lindbergh. The filmmaker does such a great job carrying the "Walkabout" story line, and is able to demonstrate the camaraderie pilots enjoy while on these kinds of long cross-country adventures. While the problems with her father were real, I left the film wondering if the main story line would have been more powerfully delivered had Petrillo left out the "daughter vs. father" thread entirely. Would I recommend you see this film? Absolutely. It will make you think about how short life really is, and about how important it is to live every second without regrets. And, it will make you immediately start planning some serious flying adventure trip. If this film does not make you want to head out to the airport NOW and crank up the Skyhawk, you should consider turning in your pilot's license. On the infamous four star film rating system, I would happily give Flyabout 3.5 stars. The story is solid, the photography is very good, the score is moving, and [of course] the aviation details are right on. If you have a party planned soon with a bunch of your pilot buddies, buy this film and show it on the big flat screen withe the surround sound cranked up...I guarantee that everyone in the room will thank you. The film can be ordered here, or you can catch it July 27th through August 2nd at EAA AIR VENTURE 2009 in the Skyscape Theater in the AirVenture Museum. You can watch a preview trailer here (high bandwidth) or here (low bandwidth).